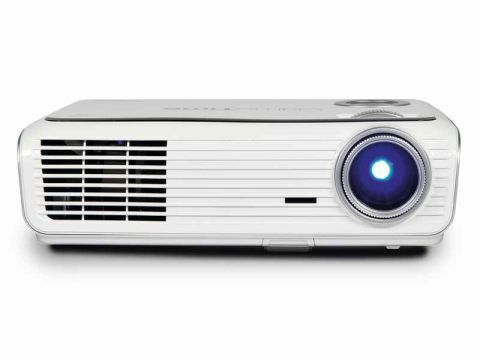 An idiot-proof portable projector that doesn't fill a room with cables is something of a Holy Grail among home movie fans at present, and Optoma also clearly sees a market among gamers for its ultra-compact GT-3000. Part of its GameTime range, the lightbox is resolutely targeted at the youthful Nintendo Wii market. It's even styled in an ice white casing and has an impressive 2,300 ANSI lumens brightness for daytime use. The inclusion of a separate speaker is a convenient touch, though its iPodesque design is unconvincing. It connects to the projector via a single 3.5mm phono cable. However, the one it bundles with is only a couple of feet long, and that suggests it's designed to be placed alongside the projector itself, just in front of the viewing position. Surely to have made it physically part of the projector would have achieved the simplicity to which the machine clearly strives. The downside of the GT-3000 is that it does not do high-definition, just Wii games. Equipped with just three basic video inputs – composite video, S-video and a VGA port for hooking-up a computer – the device can only handle standard definition signals, although the lack of component video also means that progressive pictures from a Wii aren't accepted either. If you do want the option of watching movies, the GT-3000 can just about accommodate your wishes: despite its 800 x 600-pixel resolution, a 'fake' widescreen mode is on offer alongside an impressive roster of picture tweaks for fine tuning. There's also a Scart adaptor that can be used to get pictures from a DVD player or set-top box into the projector via either a VGA or S-video cable. Setting-up the GT-3000 is not quite as easy as it's made out to be: you'll need a decent sized room, for starters. It can project a maximum 300in image from 12m, but more likely you'll only be able to achieve something a lot smaller – a 60in image is possible from around 2m. That's fine, but it could mean positioning the projector behind where you intend to sit, which brings up the thorny question (considering the rather messy cabling) of what exactly you're supposed to do with the speakers. Besides, with a limited optical zoom we had problems focusing the projector properly from closer than 2m from the screen. The setup of the speakers is unusual, but welcome. Two stereo speakers are included, plus a small subwoofer that folds down to form the speakers' stand. With a remarkable resemblance to an iPod dock (there's an iPod-shaped space between the speakers, though no actual dock) the speakers accept sound via a simple 3.5mm phono lead, while a stereo phono adapter is also included. The downside to this completely separate setup of projector and speakers is that the GT-3000's remote can't be used to change the volume. We'd rather the speakers were physically part of the projector itself, despite the fact that the sound quality might suffer since the speakers are at least twice the height of the projector itself. Automatically tuning into whatever input is attached, the GT-3000 is capable of producing some impressive images. However, despite its claims of high brightness, it doesn't produce a watchable image if there's much ambient light in a room and it's best used in a total blackout. In pitch darkness the machine is able to display pictures replete with rich, well-saturated colours and decent contrast. Impressive black levels follow, though the GT-3000's use of DLP technology does have a major disadvantage: as the colour wheel whizzes around it produces stripes of colour that can be very distracting. Not everyone is susceptible to this 'rainbow' effect, but if you are, the GT-3000 is best avoided in favour of a LCD model. Kept to a reasonably small size, the image's sharpness is acceptable given the low quality video inputs, although the widescreen mode should be avoided; the GT-3000's DLP chip is most at home producing a 4:3 image. It's not something that should bother too many Nintendo Wii players, who are more likely to be disappointed by the visible softness of images sized anywhere above 80in. Used with games, the speakers perform relatively well. The two speakers and mini-sub combine to produce a soundscape that has plenty of bass for most games' sound effects and simple music. Used at high volumes there's audible distortion, with the speakers lacking enough power or range to competently handle either movie soundtracks or music. That said, they're far superior to most built-in projector speakers. With no high-definition or even progressive-quality pictures, a basic 4:3 video resolution and a slightly messy speaker arrangement, the GT-3000 will seem something of a step backwards if you've already got a bigscreen TV or have home cinema ambitions. If you're not in that category, however, and want something to soup-up games on the Wii, the price alone makes it worth considering.